Gabions are increasingly being used to address different issues in hydro power plants. 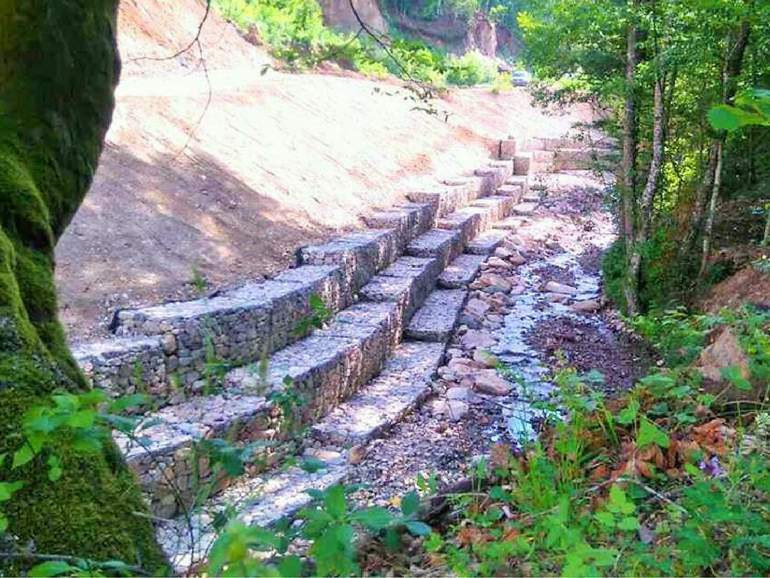 Our gabions were used at Brbusnica Hydro Power Plant (HPP) in Macedonia to build a retaining wall to prevent landslides and to protect the river bank from erosion. The Small Hydro Power Plant of Brbusnica is part of the Macedonia state project to build a number of small hydro power plants along Macedonia’s rivers, with the support of private investors. However, with landslides and river bank erosion being a problem at Brbusnica HPP, the investors contacted Ergo Kom Doo, our distributor for Macedonia, for a solution. Ergo Kom Doo designed a solution including a gabion retaining wall and Reno Mattresses, which can prevent landslides and stop erosion by providing the river banks with longitudinal protection. The gabion wall is 120m long and 2.3m high. For this project, 400 m³ of gabions and 360 m2 of Reno Mattresses were installed. The investors were very pleased with this solution and decided to use gabions at other small hydro power plants across the country. For more information on our longitudinal protection solutions, please contact us.